It's Adobe PhotoShop that GIMP competes with, of course, and GIMP--short for "GNU Image Manipulation Program"--has won countless enthusiastic fans, including yours truly. On Thursday, the project's developers announced the release of GIMP 2.8, a new stable version that culminates more than three years of work. Numerous long-awaited features have been incorporated into this new release, so it's definitely worth checking out. Here's a quick rundown of some of the highlights. Perhaps the most widely anticipated feature now included in GIMP 2.8 is an optional single-window mode. Users can toggle between the default multi-window mode and the new single-window mode; in the latter, GIMP will put dockable dialogs and images in a single, tabbed image window. When single-window mode is selected, it's also preserved when you quit and start GIMP again. Also new in this updated software is that text editing with the Text Tool is now performed on-canvas instead of in a separate window. Beyond more standard text formatting features like font family, style, and size selectors, users get numeric control over baseline offset and kerning as well as the ability to change text color. Saving and exporting images in GIMP are now more distinct processes than they were before, and images can now be saved only in GIMP's native XCF format. To export into other formats, users need to select File->Export. “This distinction makes it clearer if all available information is stored in a file, or not,” the software's release notes explain. Because a flat layer structure can be limiting in complex compositions, GIMP 2.8 introduces layer groups that let layers be organized in tree-like structures. 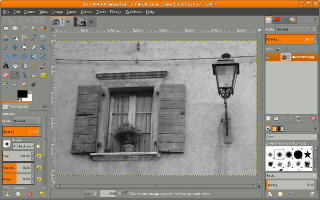 Layer groups are fully scriptable through the GIMP plug-in API, the developers note. All tools rendering on canvas now use the Cairo graphics library “to provide smooth antialiased graphics and make GIMP's look and feel match modern users' expectations,” the project team notes. Most plug-ins have been ported over to Cairo as well. So, even more improvements are coming down the pike. I use GIMP practically every day for creating and editing images, and I'm constantly amazed at the power it delivers. Want to give version 2.8 a try? It's available as a free download from the project site.